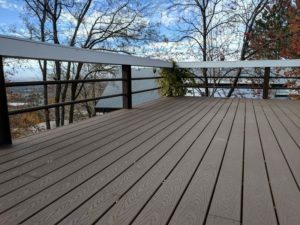 It’s a brand new year, and while decking season hasn’t quite begun, contractors and customers are making their plans. Gathered from trade shows and popular internet searches, we’ve found the latest and greatest trends to look forward to this spring and summer. Whether you’re building a brand new deck or renovating an old one, start here to explore the best deck ideas for 2018. 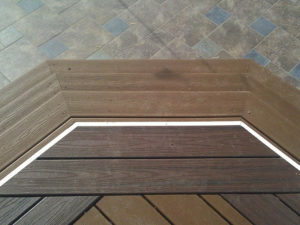 While composite decking isn’t a new trend, it certainly is popular. Now, more than ever, homeowners are choosing composite materials over wood because of the incredible benefits. 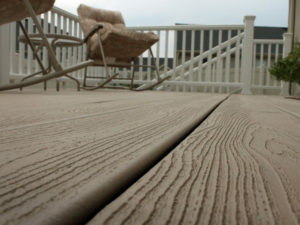 Composite decking is strong and sturdy and it’s not as susceptible to rot, mold, and insect damage. Most composite materials have warranties that extend more than 10 years and require very little maintenance. It’s also a great option for people looking for a more sustainable and eco-friendly alternative to wood. 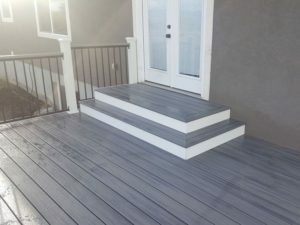 There are many different types of composite decking including, Trex, Azek, and Fiberon, so it’s easy to find something that fits your needs and your budget. +FDS Tip: Trex is our top selling composite material because it’s been the industry leader for over 20 years. 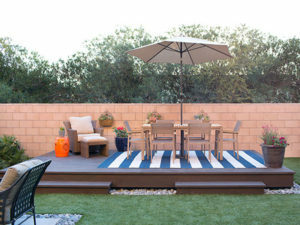 It’s a simple idea, but this trend is taking hold as more people look to expand their outdoor living space. You don’t have to be restricted to building a deck, attached to your house, right off the back door. 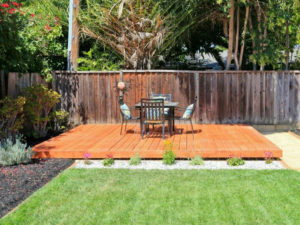 You can have a deck anywhere in your yard and build it to almost any size and shape. A floating deck is built on a base, just a few inches off the ground. The skirting hides the framework and it makes your deck look like it’s floating (which is how this style gets its name). These decks are the perfect space for outdoor seating, dining sets, grills, fire pits and beautiful planters. +FDS Tip: Your base is the most important part of your floating deck. Consider Trex Elevations steel framing for a sturdy, durable, and long-lasting framework. The latest trend in railing is horizontal balusters. These are the slats or rails placed in between your railing posts. You could use wood planks, but many people are choosing rebar or cable to stretch between posts. 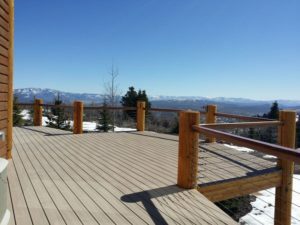 When installed correctly, these railings are just as safe as your standard wood and aluminum rails. It’s also an easy way to change up the look of your deck and your landscape, without much work. These clean lines add a modern accent to your deck and can make your deck look bigger. The width is a matter of personal preference, but you can find some cable so thin that it seems invisible, giving you a better view. +FDS Tip: When installing your new railing, consider adding lights to the posts or top rails. These outdoor lights are perfect for late nights. The most creative trend of 2018 is the use of colors in our decks. 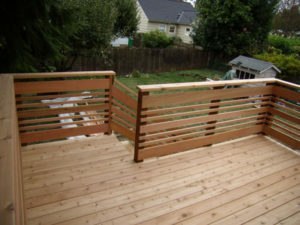 Gone are the boring monochromatic decks where every board and railing is the exact same color. With so many stains available for wood decks and a wide selection of colors for composite decks, you have more choices than ever. The most popular theme is a rich, dark, brown deck with white accents on the railing and stairs. Another favorite is a light tan deck with dark brown borders. Or for a cleaner, more modern look, choose a cool grey deck with white accents. 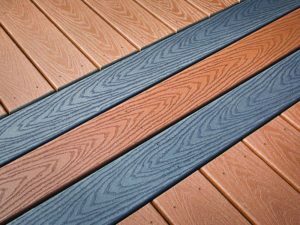 Another benefit of the composite decking trend is the vibrant colors that never need to be repainted or restained, so the color you choose is the color you keep. 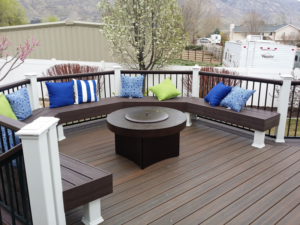 +FDS Tip: Visit our Provo or Salt Lake locations to see deck color samples in person. We’d be happy to help you mix and match to find the perfect combination. 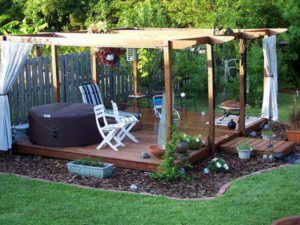 Just like the floating decks, your pergola doesn’t need to be secured to your house. 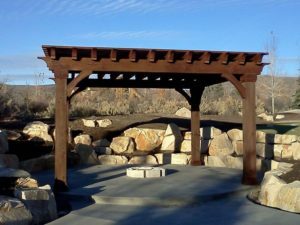 You have the option of building a pergola anywhere in your yard, especially the spot where you could use a bit more shade. Not only does this improve the use of your yard, but it also enhances the landscape. Plants, vines, and flowers can be grown around a pergola to add more greenery and shade. Even a small pergola is a great addition when you attach a porch swing. When installed correctly, these free-standing pergolas are just as strong and as sturdy as if they were attached to your house, so there’s no need to worry about them blowing over in a big gust of wind. 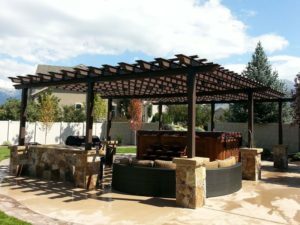 +FDS Tip: We’ve got install experts at both of our locations to help you build the perfect pergola. 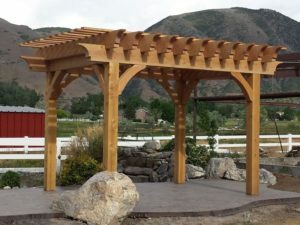 Whether you’re a DIY customer attempting your first free-standing pergola or a contractor looking for advice, we’re here to help. Whether you’re just starting to plan your deck or you’re ready to install, Fence and Deck Supply is here to help. 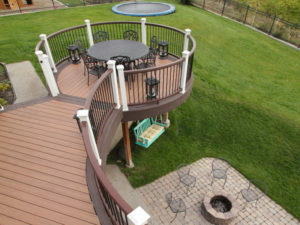 Not only do we have everything you need to build that incredible deck, we’ve also got the expertise. Visit us in Provo or Salt Lake or give us a call.